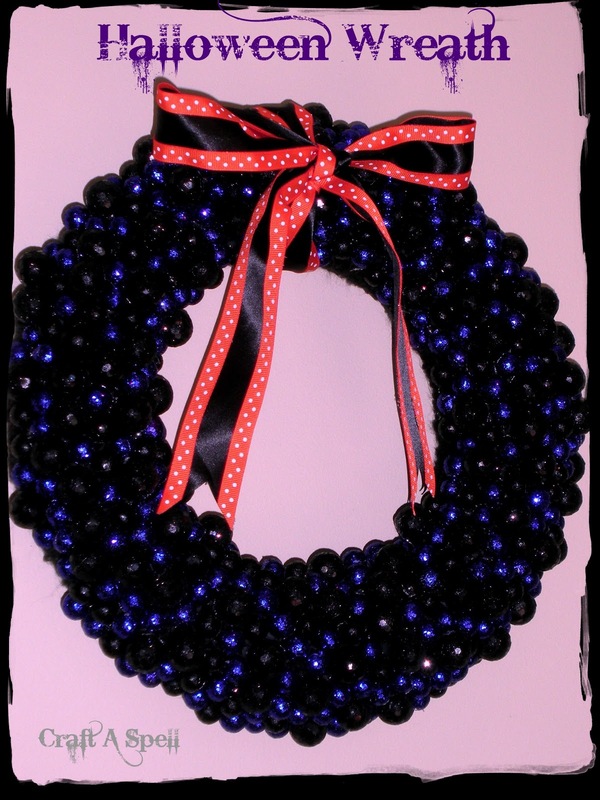 Do you remember the bauble wreath I made last Christmas? It's by far my most popular project to date. I've decided to capitalize on that. 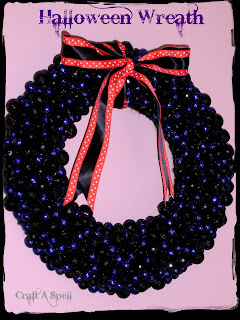 Maybe I'll make a bauble wreath for every holiday? Right now, it's time for Halloween. All I did this time was use styrofoam vase fillers in purple and black. I found them in the Christmas (ornament) section of Hobby Lobby (and, yes, I bought these about a month or two ago and there was already a Christmas section). The black came in a large pack of multiple sizes but for the purple, I had to buy the multi-color pack of purple, blue, pink, and green which meant the purple came in only one size. See? Now I will tell you, I had THE most difficult time getting a picture of this darn wreath!!! The moment I held up my camera, the purple looked blue. It was early in the morning and the sun wasn't completely up so I tried it again when I came home that night. The sun had already started to set so I decided to wait until the weekend. The sun was blazing and I still couldn't get them not to look blue! So I cheated...I uploaded the photo and tweaked the colors until I got my purple. It's still not exactly right. This is what it looked like without the photo editing. To make the ribbon I hung it with, I took this black silk ribbon and this orange ribbon with white polka dots. 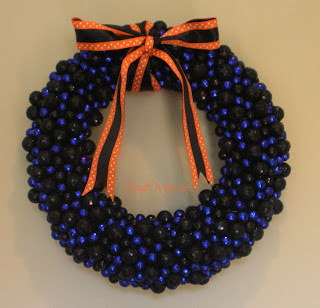 I was originally going to use the orange polka dot ribbon all over the wreath in little bows or something but I ended up not liking it. 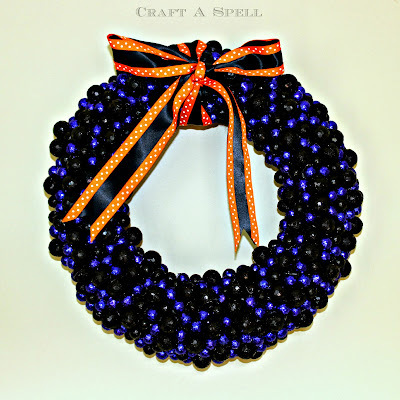 I hot glued the orange ribbon along the edge of the black, creating my own custom ribbon! I hope you'll stay tuned through the next week. 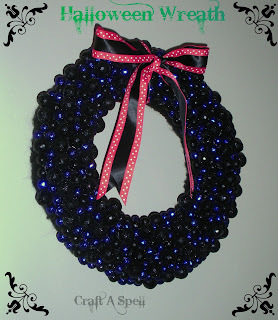 I've got a couple other bauble wreaths to share with you! 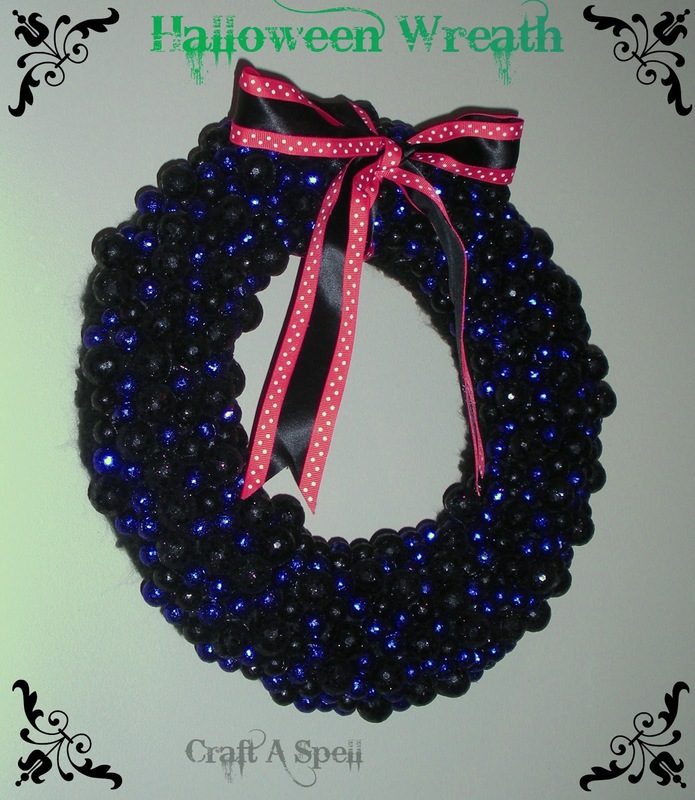 2013 Update: Here is a better picture of the wreath which I hope shows off the purple baubles a little better! That looks awesome! I am loving the baubles! And that ribbon is pretty cute too! Thanks for sharing at the Pomp Party! Hope to see you back next week! Gorgeous and very unique. I love it! I love that! I know that had to have been a lot of hot gluing, you did a great job! This is so cool! I love the black and blue. Thanks for sharing. Thank you Mikaila! I wish I had a better picture of it though. It's actually black and purple! It keeps looking blue on my camera and I can't get it to look like it does in person. Don't quite get what these "beads" are made of and if they are glass aren't they very heavy to hang on the door? They're actually just Styrofoam. You can find them at your local craft store! Super light weight. Spooky, but also very cute! Black, pink, and orange is my jam. Love how you used the colors for this wreath!